These cuddly stuffed creatures are imaginatively designed and available two ways—fully made and ready to love, or as a stuffed animal kit with everything you need to craft your own unique Woolbuddy. A little loop on top is perfect for hanging your Woolbuddy up in a nursery or playroom, or even on the tree. Dimensions: 6.5" x 4.3" x 2.5"
Dimensions: 3.5" x 2" x 2"
Amazing project and I loved making it! I truly love needle felting project! The Woolbudu brand is a high quality brand that truly let's you make a adorable project and learn a fun new craft that will take you along a amazing path of just wanting to know and do more!! I love this craft and I love it. This company makes great kits and has great instructions to learn to more and more on your own as you explore the art. Woolbuddy stuffed animals—and stuffed animal kits—are adorable, quirky characters that will melt your heart. Founder Jackie Huang designed the first one when his first child was born. Wanting to create a gift that reflected his imaginative work as a 3D animator, Jackie experimented with some leftover felt. From there, he kept on creating different personality-packed creatures out of 100% wool. Want your Woolbuddy fully finished? No problem. 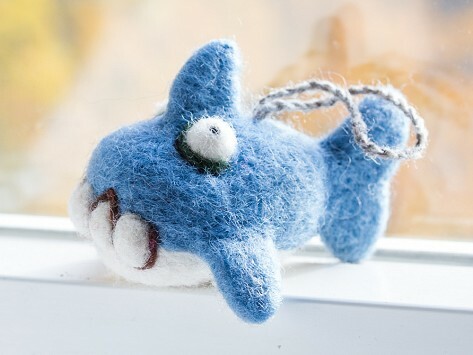 Or, if you want to create your own, there’s a DIY kit with felting needles, instructions, and all the felt you need. It makes a fun bonding project with a child, grandchild, niece, nephew . . . but make sure you’re in charge because the needles are sharp. A little loop on top is perfect for hanging your Woolbuddy up in a nursery or playroom, or even on the tree. Whether cheerfully displayed or sitting on your lap, these cuddly buddies bring smiles wherever they go.